Absurdity, at its purest, assumes its residual – common sense – exists as a constant. For a situation to feel nonsensical it must exist within the world of this context, but slightly off-center: any art that knowingly stretches or blurs the formal definition of object, for the purposes of critiquing it or commenting on it. If the author attempts to assign meaning, the art ceases to be free-form, in a way that erodes its absurdity. We need to be able to grasp at absurdity without ever reaching it. Absurdity also has a built-in meta component that syncs up with the very real phenomenon cognitive dissonance, holding two or more conflicting beliefs at the same time. When we watch Prizzi’s Honor, we know that the events in this film are unlikely to ever occur, even though they sometimes seem that they could in our own measured existence or even in another mafia-esque film. Maybe we desire this film because we desire absurdity. In fact, if we use The Godfather (either) as our reference point for clarity, quality and non-absurdity, Prizzi’s Honor feels even the more surreal. 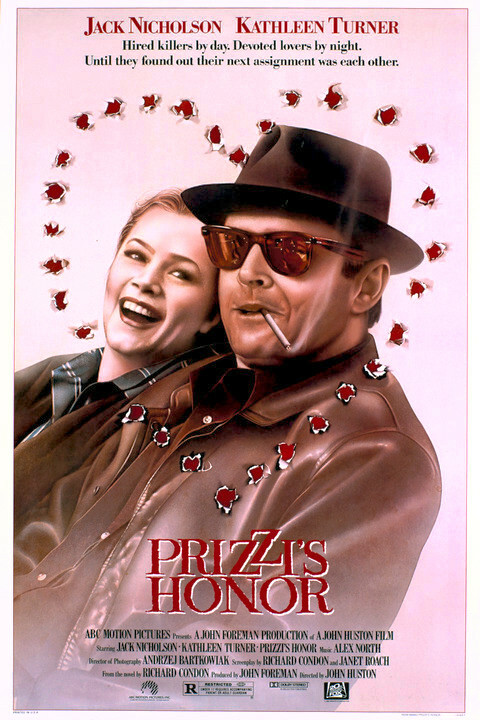 Both films are set in fictitious micro-environments where organized family business often exists through crime motifs, or through (as Prizzi’s Honor illuminates it) honor and duty. We understand that crime, as a driver for story and for history, works insofar as purposeful or logical narration will allow. Only in specific context does random killing, for example, not derail an otherwise reasonable character framework; usually this character is molded and guided toward psychotic break, but sometimes a story will include a random killing as a moment of opacity. Purposeful confusion, though, is not a hallmark of absurdity, because the director will likely resolve the issue. The killing will turn out not to be random; the character is hiding disassociative personality traits; there exists a ‘whodunit’ mystery that unfolds. These film tropes, while tricky to clarify (see: The Usual Suspects), guide an audience, as the logic behind the story unfolds. The Godfather works in context because, while Coppola shows us that Michael Corelone is not cut from the same cloth as the rest of his family, it is precisely for this reason that he becomes a ruthless boss. In contrast, most of Prizzi’s Honor makes little logical sense. Jack Nicholson as Charley Partanna happens to be an underboss based on his father’s relationship to the Don; I believe this. Yet, the pacing is off: the likelihood that the two leads (Nicholson and Kathleen Turner as Irene Walker) fall in love immediately, then have to kill each other? Don Corrado’s place in the film at all? Who are these two brothers who “run” the family? What is Maerose’s (Anjelica Huston’s) motivation, if any at all to act the way she does? This movie is intentionally hard to follow it seems, and the absurdity of the composite situations, as they escalate, gives this film its comedic stripes. It seems that this film was intentionally comedic, fumbling through shifting characterizations and an unreliable narrator, which is incredibly tricky in film, where the reader cannot rewind. Though that the reader cannot rewind allows the film to expand unabashed and, eventually, reach a muddled conclusion. The Godfather, as canon, frames the Mafia as a complex, multi-dimensional baseline against which all future films must compare, including Prizzi’s Honor. Even though Prizzi’s Honor lives on as an off-the-wall minor absurdity that ultimately gets lost in its own self-reference and inability to meander through a non-linear story arc. The acting is also a little absurd, but certainly on purpose. Charley is the everyman mafia boss-to-be, Don Corrado (William Hickey) is almost literally a living skeleton, and the Prizzi brothers? A yin and yang typology so over the top that it almost undermines Prizzi’s Honor‘s ability to dial in unabashed. We also forget, and need to be reminded, that the film itself glides through what each character thinks of “honor,” which, as it turns out, is a panacea for all situations. If we cannot agree on what it means to be honorable, how can absurd hijinks not take place? Out of Africa, 1985’s winner for Best Picture, is a classic love story, which has almost no inclination to the semi-absurd. Meanwhile, let us all leave Prizzi’s Honor where it belongs: on a shelf with all parts intact as reference for absurdity in mafia film.